Helen Temple Cooke died on April 12, 1955, on the eve of her 90th birthday. She left behind the legacy of the Dana Hall Schools, Tenacre, Dana Junior, Dana Hall, and Pine Manor, consisting of over 100 buildings on a campus of 150 acres. She was a pioneer in the education of women in the 20th century and her insight influenced the lives of thousands of women from every state in the United States and from many countries who graduated from the Dana Hall Schools during her 52-year tenure. Helen Temple Cooke was a dynamic leader dedicated to high standards of academic excellence and moral integrity, and she inspired others to follow her. The hundreds of letters from loving and appreciative students that filled her 90th Birthday Book were testimonials to her remarkable influence. Miss Cooke was born in Rutland, Vermont, on April 13, 1865, the day before Lincoln was shot, to Edmund Foster Cooke of Rutland and Mary Anne Bardwell. Her maternal grandfather, Otis Bardwell, built Bardwell House in 1852, a well-known inn in the Rutland area that was a gathering place for stagecoach passengers. Bardwell Auditorium at Dana Hall was named after him. Miss Cooke received some education in the Rutland public schools but did not have a higher degree. At the age of seventeen, she assisted in teaching at a small private school in the Rutland Fire House and two years later she became head of the school. One of her students was Helen Wheeler, the daughter of a wealthy Rutland businessman Marcellus Wheeler. In the fall of 1894, Helen Temple Cooke accompanied Helen to Wellesley to begin her studies at Dana Hall. Partly due to the influence of Julia and Sarah Eastman and partly to her own awareness of how much more she wanted to achieve in life, Miss Cooke soon enrolled in courses at Wellesley College designed for “Teacher Specials,” mature women who were interested in advanced training but who did not have a degree. Being financially independent of her family, Helen Temple Cooke tutored to earn money to pay for tuition and room and board; she lived on a meager food budget of only 18 cents a day. She continued taking classes at Wellesley College until 1899. When the Eastman sisters expressed their wish to retire in 1899, Miss Cooke decided to buy the school. Though Miss Cooke had neither the funds to buy the school nor the capital needed to develop it, Marcellus Wheeler, the father of Miss Cooke’s former pupil Helen, had the foresight to enter into a business partnership with her. On May 17, 1898, the Eastmans agreed to sell the land and the buildings consisting of Ferry Cottage, Clematis Cottage, and the School Building, all of the household goods and furniture, and the business and good will of Dana Hall for $60,000 with the premises being conveyed on September 1, 1899. Mr. Wheeler and Helen Temple Cooke each owned 49% of the capital stock; two shares were held by the bank and were to be given to the survivor. In 1901, they bought the remaining land and the original Dana Hall school building from Wellesley College. The college was unable to sell this property before 1900 due to the terms of Mr. Dana’s will. The partnership between Mr. Wheeler and Miss Cooke lasted until Mr. Wheeler’s death in February 1, 1927, at which time Miss Cooke received the two extra shares and majority control of the school. The 1899-1900 school year, the 19th of Dana’s existence, opened with Miss Cooke as principal and Mrs. Harriett Page and Miss Jeannie Evans as associate principals. Dana was described in the school catalog as a “Home School” where each pupil was “surrounded by such restraints, and such only, as are indispensable to the best results of mental work.” The establishment of mutual courtesy and honor between teachers and scholars was important. The students were encouraged, while accompanied by a chaperone, to take advantage of the art and music offered in Boston, and lectures and concerts “of a high order” were given during the school year. Pupils receiving a certificate from Dana were admitted without further examination to Wellesley, Smith, Vassar, Cornell, and Mount Holyoke Colleges. The 1907-1908 school catalog included a lengthy description of the Department of Physical Training, whose aim was “general body-building, by means of systematic gymnasium work, and out-of-door athletic sports.” The gymnasium work was based on Swedish methods and was supplemented by other exercises and marching and outdoor sports consisted of tennis, basketball, field hockey, ball throwing, and running. Each student was expected to spend at least one hour each day exercising outside. Miss Cooke had grand plans for her school. In 1902, she started building onto the existing school building. The large living room dominated by a great fireplace was impressive. On an oak panel above the fireplace, which today is over the fireplace in the Dining Center, was inscribed “The Hearth Song,” a verse written by Miss Florence Converse, one of Dana’s first teachers. 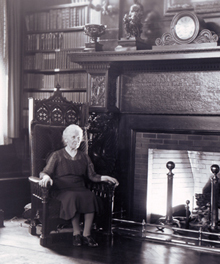 The Living Room, furnished with beautiful antique furniture collected by Miss Cooke, was the heart of Dana where students gathered for coffee and relaxation after Friday and Sunday dinners. Some of the most cherished student memories are the arrival of the Yule Log at Revels and listening to Miss Mabel Jenkins read aloud from Dickens’ A Christmas Carol. In 1905 the Eastman Reference Library, a gift from the Class of 1905, was built and in 1912 a new gymnasium was completed. Bardwell Auditorium was dedicated in 1929, enabling Miss Cooke to bring the most talented musicians, poets, writers and lecturers of the time to Dana. Many activities were instituted in the early 1900s. The first class book called The Tattlerwas edited by Mildred Hoyle 1903. The senior honor society Theta Kappa Delta was formed. The Athletic Association was organized in 1902 and the first Field Day was held in 1903. Junior and Senior Spread, events anticipated with much excitement, are mentioned in the 1902 Class Book. Elections of the junior and senior class officers were also cause for celebration. Each class endeavored to carry out their elections in the utmost secrecy. The minute the elections were over, Delia’s bell (Delia was the maid who kept the school on schedule) was heartily rung. The names of the officers were written on a bulletin board while the seniors assembled on the left-hand steps going up to the Living Room in the Court, the juniors on the right-hand steps and the sophomores in front of the oak bench in the Court itself. A “step sing” was initiated with the Court resounding with the school’s Alma Mater, Spread songs and class songs. Commencement Week began with the planting of the class tree in a tradition called Tree Night. The seniors, dressed in Japanese kimonos and carrying lighted Japanese lanterns, secretly gathered at night and planted their tree in a secret spot with the Spade, decorated each year with ribbons in class colors. Miss Cooke was an astute businesswoman and eccentric accountant who managed to finance her dreams for Dana through her skill as a collector. Her collection of Persian art was unique and was matched by only one or two museums. It included the best of the modern masters as well as 17th- and 18th-century album pieces celebrating the Persian genius for ornamental design. Her collection of American antique furniture, bought over a 40-year time span, showed her keen knowledge and feeling for furniture design. This collection represented the top-quality furniture made by Massachusetts craftsmen working between 1720 and 1810 and included a block front secretary illustrated in Wallace Nutting’s Furniture Treasury. She managed in the space of nine years to turn her initial investment with Mr. Wheeler of four buildings into eight buildings. In 1918, she was the biggest taxpayer in the town of Wellesley. By the time of her retirement in 1951, Miss Cooke had increased the size of the campus to 70 buildings on nearly 100 acres. In 1941, Helen Temple Cooke retired to Shamballah, her home located high above Benvenue Street. It was named after the poem of the same name written by Canadian poet Bliss Carman during a weekend visit with her. Miss Cooke lived happily surrounded by her oriental carpets, beautiful American antiques, and etchings. It was there that she received many visitors, especially the alumnae who often sought her advice. Plans had been made for a celebratory convocation on April 13th where she was to have received a birthday book filled with congratulations in honor of her 90th birthday. The four-school convocation held on June 4, 1955, became instead a memorial to Dana Hall School’s beloved and distinguished leader. Fergusson, Peter, James F. O’Gorman, and John Rhodes. The Landscape & Architecture of Wellesley College. Wellesley, MA: Wellesley College, 2000. [Grimes, Mildred]. “Helen Temple Cooke.” Unpublished article. Dana Hall Archives, Wellesley, MA. Hill, Alfred Tuxbury. With the Light of the Past. 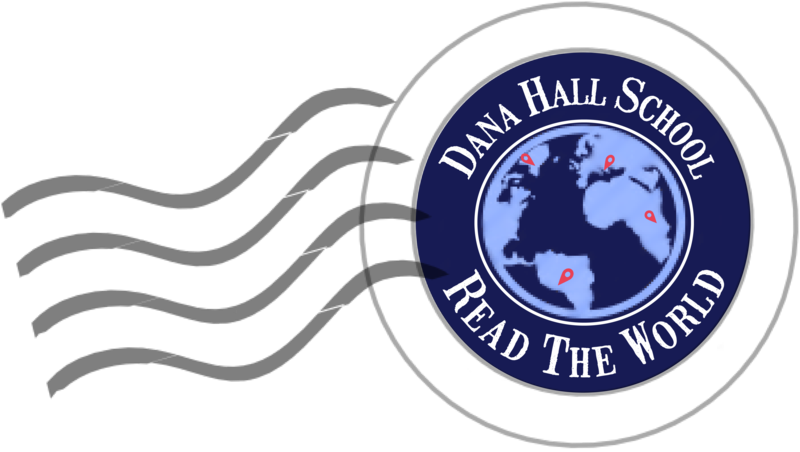 Wellesley, MA: The Dana Hall Schools, . “A Memorial Tribute to Helen Temple Cooke.” Dana Hall Bulletin 1955: 4-7. Post, Winifred Lowry. “Miss Cooke.” Unpublished article. Dana Hall Archives, Wellesley, MA. Post, Winifred Lowry. Purpose and Personality. Wellesley, MA: Dana Hall, 1978. Robert C. Eldred & Co, Estate Auctioneers. Unreserved Auction of The American Furniture and Persian Art Collection of the Late Helen Temple Cooke. East Dennis, MA: Robert C. Eldred & Co, Estate Auctioneers. Russell, Ruth Woodman. Pine Manor: The First Fifty Years. Chestnut Hill, MA: The Pine Manor Press, 1969.